I don’t know why more people don’t do this. It is fun, it is tasty, and it is cheap. 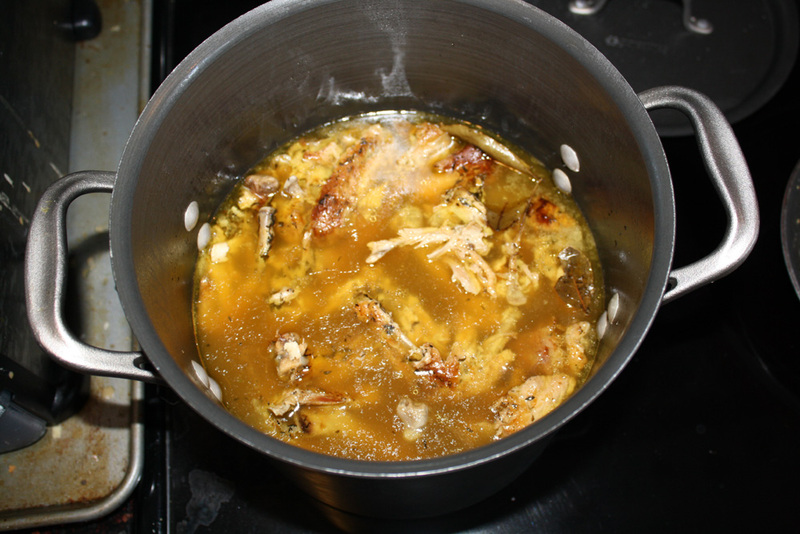 Every time you eat a chicken, or especially a turkey, save all the scraps. The bones, the skin, the connective tissue. It isn’t pretty, meat can still be attached. Toss it in the fridge overnight in big plastic bags. The next day get your biggest tallest pot (tall is better than wide, less surface area at the top for evaporation) and fill it with the carcass bits, then fill with water or store bought broth, how much to fill depends on how much stock you want, or how strong you want it to be. Toss in some salt (you can add more later) and any aromatic veggies (carrots, garlic, onion, celery) or herbs (thyme, bay, rosemary, parsley) you want, you can also wait and just add the veggies to your finished soup later. With herbs you can add them now though, I like to go out and just pick a few big sprigs in the garden and toss them in, they don’t need to be chopped. Bring to a boil, then reduce heat and cover, simmering or lightly boiling, for 4-8 hours (do this in the morning while making breakfast). Strain all the the solids with a colander, saving the liquid of course, and then use a fat seperator or skim off as much fat as possible, and you have liquid gold. If you put this stuff in the fridge, chances are it’ll end up looking like jello because of all the delicious collagen (techically protein, but the finger licking good quality of it will make you think it is fat) that you pulled out of the chicken carcass. This stuff makes the best soup, or you can add a little bit to mashed potatoes, or use in any recipe that would call for chicken stock or broth. To make the soup transfer your liquid gold to a new pot or crock pot, add in left over or new chicken meat (chopped small) your vegetables, potatoes, etc. And cook, add noodles or dumplings later for appropriate cooking times, or serve with fresh baked bread. Best soup ever, and pretty healthy, darn near fat free if you separated the fat out. 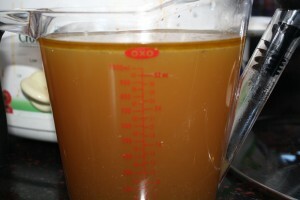 Store bought stock or broth has salt in it, but your homemade stuff will not unless you add it, so you need to season it to taste. Put a little salt in, try a spoonful, ask yourself, does it need more? If so, add a little more, try again. That is what “season to taste” means. Knowing when it has enough is a skill chefs develop over time. Remember, you can always add more salt, you can’t take it back out, so go slowly until you get better at estimating. The day after is even better, it gels up in the fridge and the soup gets ultra thick. And to think, you were just going to throw that chicken or turkey carcass away. Next PostHow to cook with Nutmeg, and have it taste good.